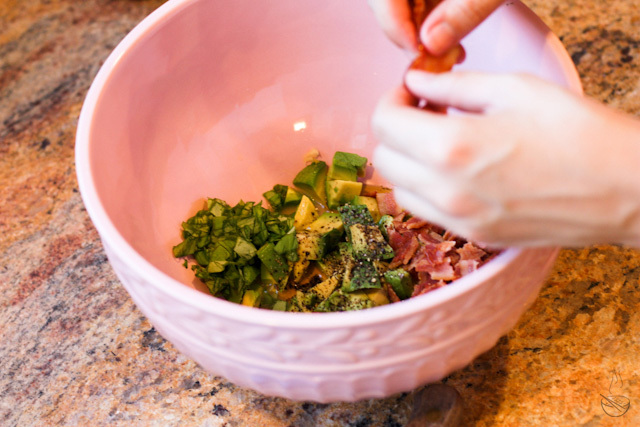 I came across this quick and simple pasta salad recipe on Pinterest a few weeks ago and, with a few of my own modifications, it has quickly become our summer favorite. Estimated cooking time, from fridge-to-tummy: 30mins. 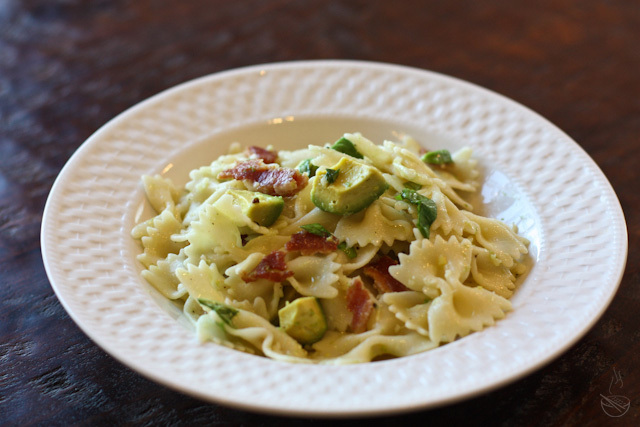 Mark lovingly calls it, “Bacon Bow-tie Bonanza” and considers it a very “manly” dish, since it has bowties, bacon, and I guess avo (his favorite), and “tastes awesome when chilled.” This will be the second time in a month that he has requested I make it for him. It’s the perfect summer serving to fight off these summer afternoons. I eyeballed the original recipe the first time that I made it, but have since made a few adjustments. I have decreased the amount of basil used to about 1/4 cup, increased the amount of bacon to 8 slices, used a few more splashes of fresh squeezed lemon juice, one more “once around” with the olive oil, and a few more spins of the pepper grinder. I happened to have some mozzarella cheese in the fridge so I added it in addition to Parmesan. I loved how melty and gooey it became when it mixed with the warm pasta too, so I highly recommend this add-on. 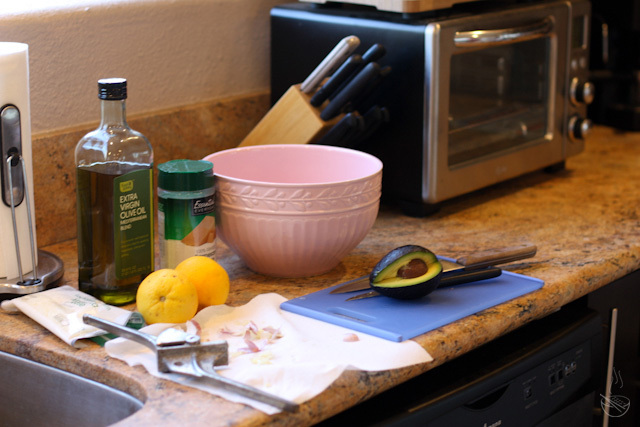 Pro tip: When crumbled bacon is needed, save time by laying it out neatly, between quality paper towels, on a microwave-safe plate. I typically microwave it on high in 2 minute increments until it reaches its desired done-ness (It took me about 7mins for dry crunchy while chopping veggies in between!). This lil’ cheat cuts down on time and grease! Yum! 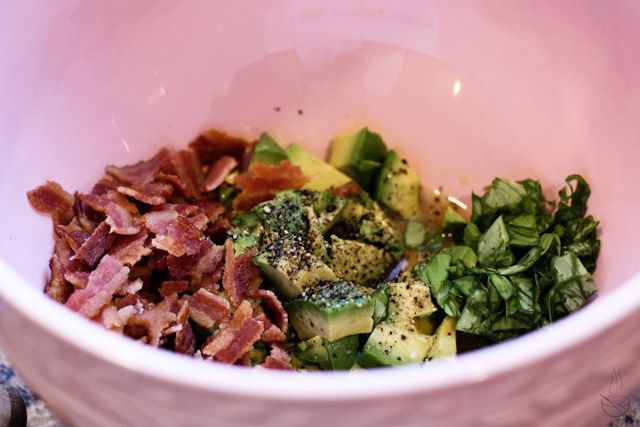 These are perfect ingredients! I think I need to make this. Thanks for the recipe! GASP! this looks delicious! must try it this summer!